If there is an indispensable character in the animation of all times and in the hearts of all the children of the world, it is Mickey Mouse. And next to the world's most famous mouse has always been his inseparable companion, the adorable Minnie. 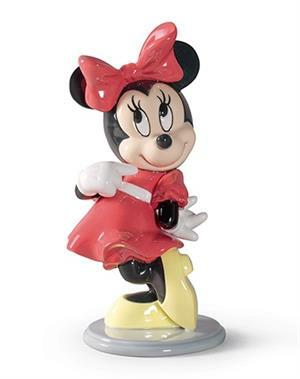 Together they made their debut in 1928 in what we now consider Disney's first undisputed success.The cuddly Minnie Mouse stars in this piece, which is part of Lladró's Disney collection. Made of glazed porcelain, decorated in a vibrant colour and with its characteristic white gloves. A handmade piece from Valencia, Spain.